The washing machine is supposed to make things better, more convenient and quicker. It’s not supposed to eat your socks up. Is there a magic gnome who takes your socks while they’re in the wash? Is there some magic in the washing powder that perhaps makes the socks vanish or is there a more sinister reason why a pair of socks becomes a lonely singleton in one wash? There’s an obvious sign if your washing machine is eating socks and it’s one you don’t need to count your remaining underwear to figure out. 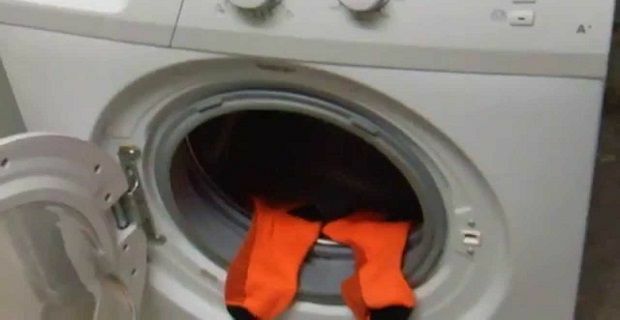 If your washing machine smells musty, there’s every chance it’s munching on your socks. Now before you go and head to the supermarket for a washing machine cleaner like Dr Beckmann, you might want to check the seal of your washing machine. This is the rubber ring that runs around the opening. It’s helps the draw to vacuum shut when the machine’s in operation but it also has a flexible rubber ring in the port hole that gathers stuff like tissues you forgot to take out of your pocket and other junk like empty wrappers. This is also the place you’ll find your socks. There’s an area between the drum and the rubber seal that’s just large enough for socks to fit in. When a rapid cycle is going on, there’s no telling where your clothes will end up. Have you ever opened the washing machine after a spin cycle and found an errand sock that didn’t make the spin because it spend the duration of the cycle between the rubber seal and the glass door? Well, socks like those often find themselves lodged in the area between the drum and the seal. If you don’t find the sock quickly, it’ll get mouldy and give off that horrible smell we talked about earlier.